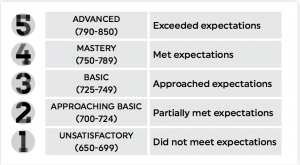 Last week Louisiana released their 2015 state K – 8 Math and ELA assessment results. These long awaited student academic performance scores, based on the new Common Core state assessments (PARCC), are the culmination of nearly three years of preparation by many educators in Louisiana. 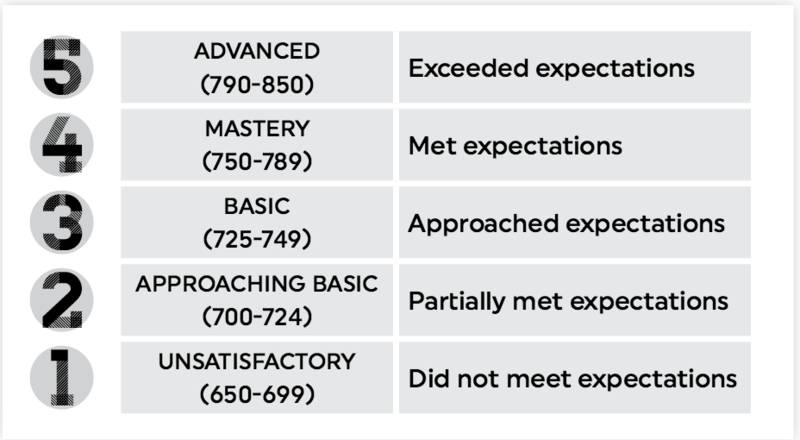 Not only has the “expectations” bar moved much higher, but results are based on a new (and controversial) statewide test that would allow scores from Louisiana to be compared directly to scores from students in 11 other states. 45% of Louisiana students scored Basic or above. 23% of New Orleans students scored Basic or above – 22 points behind the state. 33% of Louisiana students scored Mastery or above. Educators across the country were worried about the increased rigor of the more challenging standards, the new assessment tests and the impact that the reported results would have on teachers, students and parents. For Deanna Rogers, retiring Principal of Dwight Eisenhower Academy Charter School in New Orleans, the new standards presented both a challenge and an opportunity. Deanna’s career as an educator has spanned more than 4 decades, 5 states and many schools. 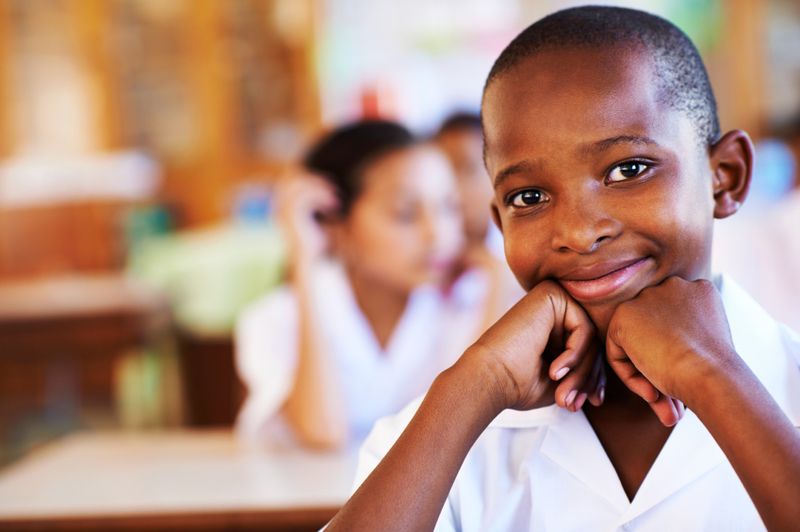 As Principal of a charter school in New Orleans, a city recognized as a hub of educational innovation, Deanna knew back in 2013 that the rigor of the new standards required new strategies and perspectives if she was going to prepare her students to graduate prepared for high school in 2015. Deanna’s dream back in 2013 was that Eisenhower Academy’s graduating class of 2015 (8th graders) would meet the new rigorous standards that students from 11 states were to be measured on. Although Eisenhower Academy of Global Studies is one of the many charters in New Orleans’ recent all charter district, Ms. Rogers set her goal to be comparable to the students in Massachusetts, New York and the other states taking the PARCC test. A goal that was bold given the realities of her school in Louisiana. The school’s 2015 enrollment of 790 K- 8 students were primarily from high poverty neighborhoods across New Orleans. The school’s enrollment had increased by nearly 200 students across grade levels two years prior. Many in her leadership team were new to the school and their positions. Eisenhower is one of 4 elementary schools in the Algiers Charter School Association (ACSA), the largest CMO in Louisiana at the time. After Ed Inquiry surveyed the faculty and students across the ACSA and reviewed historical performance scores and other data from its schools, it was clear that Eisenhower had the “ingredients for collaboration, innovation and rapid growth.” Surveys showed that many teachers were new to the building and motivated. Students also reported that they were willing to be challenged more. They recognized that grades were important. The school environment was reported to be “safe” by both teachers and students. And most important, as Principal, Deanna Rogers had a clear vision of the outcome she wanted to achieve and an openness to think totally out of the box even with 40 years experience. Deanna challenged Ed Inquiry to design a “campaign of rapid change” using insights from the data collected, combined with research on turn-around, and models of successful turn-around from across the country. The “change campaign” launched at Eisenhower was “branded” as The Biggest Winner Math Challenge, which was instrumental in motivating and engaging both students and parents enough to focus them on closing math skills gaps and leaping ahead to the new standard of Mastery in math. The campaign included the use of social media, music, video and a game show like theme to unite the school in math skills acquisition. Student engagement increased more than had been seen for any academic activity. Diagnostic tools were introduced to the school, used to assess math skills gaps so that “prescriptions” for learning and gap closing strategies could be developed for each student (personalized learning). Prescriptions recommended a combination of tutoring, technology or classroom instruction (blended learning) to close specific skills gaps or to help students acquire new skills and math knowledge. 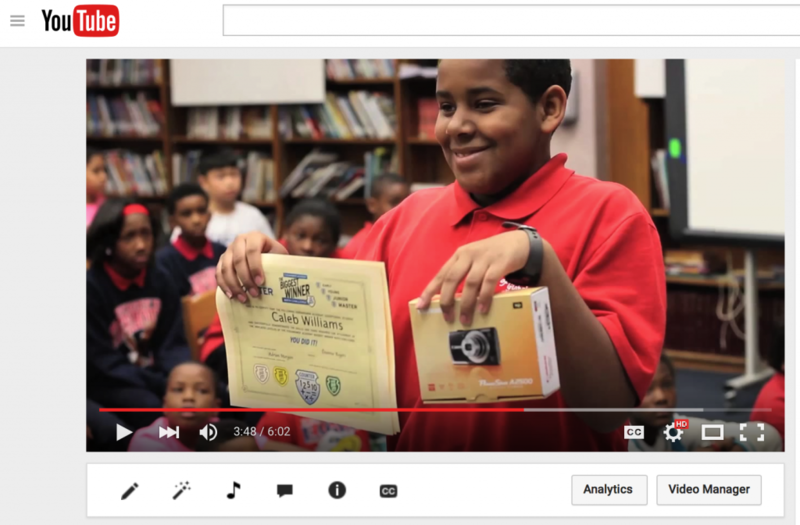 The campaign created a well received You Tube channel of communication to students and parents. Early diagnostics used at the start of each pilot year clearly showed that there was a wide variation of student ability in many of the classrooms in Eisenhower. Some students were more than 3 grade levels behind while a small few were on grade level based on the new standards. With so much variation in ability, teachers could not easily differentiate their classroom instruction, addressing specific student needs, while also covering the grade level material. But the “campaign of change” motivated students to push through lessons and use new online technologies to close skills gaps. Teachers were able to focus more on teaching the new standards knowing that students that were behind were catching up and students that were moving quickly ahead had access to more challenging materials online. Every few months school wide assemblies were held for award ceremonies where student growth was recognized and rewarded – keeping both students and teachers motivated and progressing. When Deanna, reviewed the latest 2015 state assessment scores for Eisenhower she knew that she had succeeded even though there were many that challenged her intuition, experience and understanding of the needs of her students. “We did it! I wanted to make sure that my last 8th grade class was ready and on track for college. I wanted to make sure that they were competitive with students from Massachusetts, New York or elsewhere. I wanted to make sure that they learned how to learn using the newest tools and technology. For many, we succeeded. 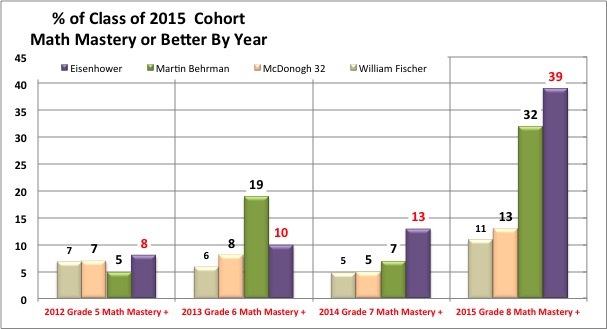 I wish we could have done more.” Overall Eisenhower Academy’s 2015 results across grades 3 – 8 were 23% mastery in math compared to 8% last year an increase of 15 percentage points. But she is particularly proud of her graduating 8th grade growing 26 percentage points in math mastery in 1 year! Deanna has since retired as Principal of Eisenhower Academy and will remain in New Orleans this last year before returning to Kansas City to be with her family where she will continue to focus on educational opportunities for children. Nearly 40% of Eisenhower’s 2015 graduating 8th grade class attained the Mastery level in math – the new goal – on the PARCC test. These students are ready to compete with students from Massachusetts, New York and globally. The results are clear. 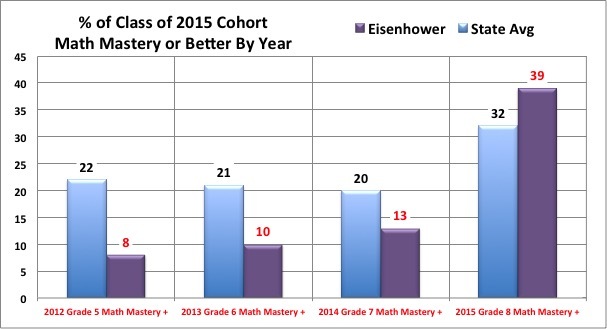 Within elementary schools in New Orleans, reporting scores for 8th grade in 2015, Eisenhower is in the top 10 of those that made the greatest year to year growth in their math mastery scores for the 2015 graduating cohort. Innovation in education is not easy. Many educators and school leaders are looking for a school transformation silver bullet. What may be more needed is a cultural transformation that may take years, require external collaborations to kick start while adopting techniques proven to be effective in other schools and the private sector. Technology alone does not bring about change. People do. Campaigns of change are complex – but in the case of Eisenhower – one school leader had the foresight, understanding and patience to create a multi year campaign of change that prepared many of her students to succeed and thrive in high school. This is one of many strategies emerging from New Orleans’ education innovation. 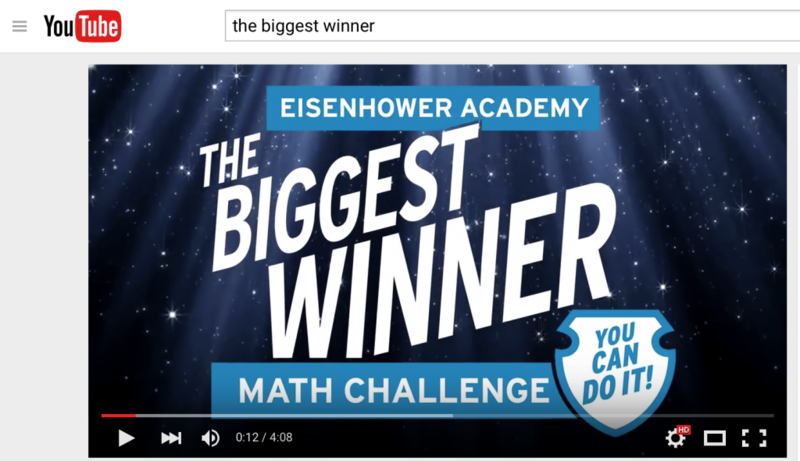 The Eisenhower and Biggest Winner Math Challenge video case study is freely available on Ed Inquiry’s You Tube Channel.